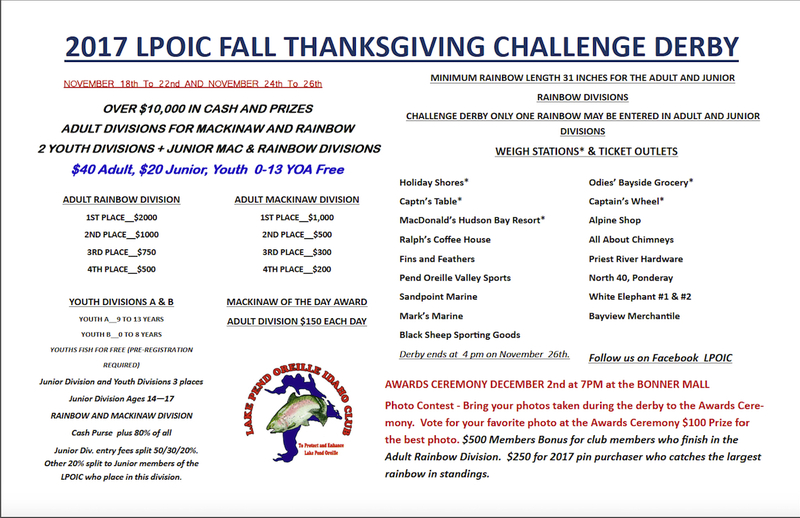 2017 LPOIC K&K Annual Fall Thanksgiving Derby! ATTENTION ALL ANGLERS! MESSAGE FROM LAKE PEND OREILLE IDAHO CLUB…Many of you have heard and are aware that there was a dust up and our long standing 40 year plus Thanksgiving Derby was in jeopardy of not receiving a permit to hold our derby. We are happy to announce that our derby has been granted a permit and we will be fishing the week of Thanksgiving, as we have for so many years. I’ve attached the Derby Poster here and put it up on our website. No changes have been made to our derby rules. In moving forward with conservation and restoration of the Rainbow fishery, this derby will be a Challenge Derby. There are many reasons we’ve decided to make this a Challenge Derby, but the biggest reason is that the Rainbow fishery has not been restored and is in a fragile state. From the years 1977 to 2000, LPOIC awarded 166 patches for fish being caught over 25 pounds. From 2000 to 2017, 5 patches have been awarded, the last two were Mackinaw. Our Rainbow fishery needs as much help as possible right now and we are committed as a club to do everything we possibly can. We encourage you to release as many small fish as possible to give them the necessary chance to spawn in the Spring. You should be aware that there will be another derby on the lake at the same time and if you have any questions about that derby, you need to contact the organizers of that derby. Thank you to all the board members of LPOIC, members and any and all people in support of our club, especially our sponsors. THANK YOU!